Its been over a year now since my husband (Larry) and I left our city life in Los Angeles, California to pursue our passions in Tucson, Arizona. Larry and I gave up a lot to be here. We left our full-time jobs, and even more difficult, I left my family. We wanted to live a different life and be our own bosses. To live as artists in the desert, embracing each moment and living our dreams. It has been an intense year, but an extremely rewarding one as well. I am often brought to tears by the overwhelming support I’ve received from people in the community who appreciate my art. When I was given the opportunity to have my very own solo art show, I was over the moon. I decided to call the show, “Desert Dreams” to celebrate my artistic journey & to feature pieces that I made during my first full year of living as an artist. The pieces in the show are snapshots of a moment in time that I will always treasure and I’m happy to have the opportunity to share them. If you’ll be in Tucson this Friday night, I’d love for you to come to the opening reception of my very first solo art show! Come see some of my art in person, chat for a bit, color and celebrate this moment with me. When: Friday, December 8, 2017 (6-8 pm) The art will be on the walls until March. Over 20 original pieces of art will be for sale for $200 or less. An Audrey event would be nothing without coloring. I’m bringing coloring pages and supplies so we can color together! 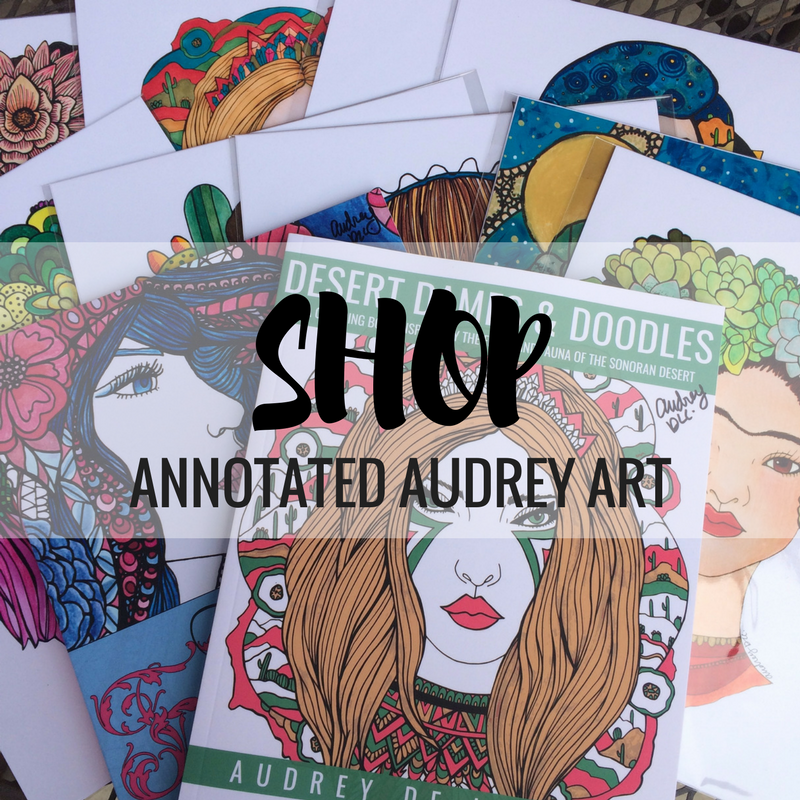 If you are interested in purchasing any of my coloring books, they will also be available for sale. Free goodie bags for the first 25 guests. A selection of some of my favorite art prints will also be for sale. AND, here’s a photo album with the work that will be on display at the show. Desert Dreams Photo Album.